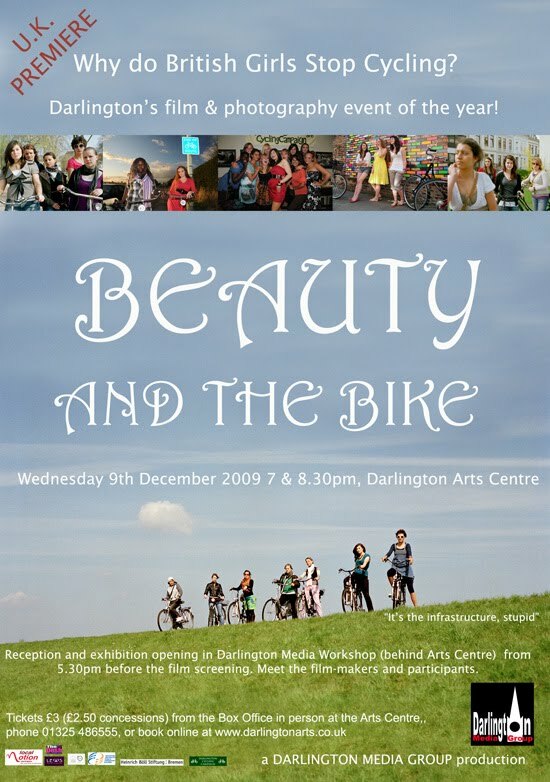 For some time now I've been aware of the Darlington Media Group's production Beauty and the Bike, which is to have its premier on the 9th of December in Darlington in the UK. In this project, investigating why it is that British teenage girls don't cycle in the same way as their German counterparts do, a group of British girls from Darlington were taken to Bremen in Germany. The British girls ride bikes infrequently. The German girls ride a lot. Even from this short from the film you can see why this is. The infrastructure in Germany supports and encourages cycling as a means of transport, while the infrastructure in the UK does not. "Why do British girls stop cycling? By simply asking this basic question, the film reveals the damage that has been done by 50 years of car-centric transport policies. Whilst we fill our lives with debates about risk assessment, cycle helmets, cycle training and marketing strategies to try to persuade people to cycle more, the basic barriers to cycling remain untouched - generous urban planning towards the car, and the resultant poor motorist behaviour towards cyclists. Is it any wonder that most people find cycling unattractive in the UK, but attractive in cycling-friendly towns and cities? It's the infrastructure, stupid!" Darlington is one of the "Cycling Demonstration Towns" in Britain. They have recently produced a report on the effectiveness of what has been achieved so far. After the cycling demonstration town initiative, 2.9% of Darlington pupils have cycling as their usual mode of travel to school. Just under 23% of the adult population of the town have used a bicycle in a typical week in the previous year. It's not clear to me what the 'cycling town' initiatives are providing in the way of infrastructure on the Dutch model. And although it's a provisional report, I think it's a bit ominous that manual counts revealed that "two towns showed a decline in cycle activity (between -2% and -5% per year)." Freewheeler: While I really like the Beauty and the Bike initiative, I have to say that the UK's demonstration towns themselves are not so impressive. Unfortunately the answer about how much infrastructure they're providing is very easy. It would appear to be very close to zero. The result is as you point out, that they've a few towns slightly up, a few slightly down. Much press is made of the small increases, though the overall result is sadly very little. Britain could have simply read the results of the demonstration towns in the Netherlands, which really did try a lot of different things in infrastructure and came up with solid results. That would have been a way of leapfrogging this time wasting period and going straight to building the necessary infrastructure. BTW, I like your blog. Please send me your email address as you seem very difficult to track down. David - is that a flicker of light at the end of the tunnel? I don't know but it looks like Darlington is doing more than Bristol has. One of the really good parts of the video is none of the girls were wearing a helmet even in the UK! Perhaps the worst comments was front one of the girls who said - "it only needs a can of paint". We know only too well that lots of tins of paint have been used to very bad effect here in the UK, what is needed is real infrastructure such as in Assen. Bob: Let's hope it is a flicker of light. As for "it only needs a can of paint", yes you're right of course. By British standards, the German infrastructure is amazing, but I've cycled in Germany and it really is not up to the Dutch standard. As ever, the quality of the infrastructure has a direct effect on the cycling rate. The Germans cycle only around a third as much as the Dutch do. It might be a flicker of light, but it demonstrates that the people wanting the change aren't the public's image of stereotypical bikers: swarthy men in lycra with chiselled thighs, but demure, fashionable young women. More power to them, I say. "All it would take is a bit of paint" to produce a safe cycle path said the girl in the video. Darlington Council has already splattered liberal amounts of paint and cartoons of bicycles around the town - all of which are ignored by the motorists who drive and park on them and the police who fail to enforce them. Not that it matters too much because most of these "facilities" are so badly designed that they are a danger to cyclists! I live in Darlington and am a qualified cycle instructor, take it from me - most of the cyclists in Darlington still cycle on the pavement and the Council still spends millions on cycle-unfriendly roundabouts to shave seconds of motorist's journey-to-work times. Stop making videos Darlington and start doing something truly constructive to reduce traffic speeds, educate road users and improve cycling safety. "Stop making videos Darlington and start doing something truly constructive to reduce traffic speeds, educate road users and improve cycling safety". Clive. 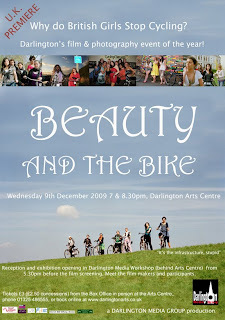 I think you will find that the people behind the film are not Darlington Borough Council but an independant media group. If you live in Darlington, and want better cycling infrastructure, are you a member of Darlington Cycling Campaign? Most of the girls in the Beauty and the Bike project have joined - as well as some of their parents - to campaign for much better standards of cycling infrastructure.